Via the 'Workflow Company Run' wizard, you can run several companies simultaneously, you can also process all director-main shareholders (or other tags) at the same time. With this, you can select the processing from several actions, such as processing the payroll run or locking the payroll run. Go to the 'Start', 'Workflow', 'Settings' or 'Overviews' tab. 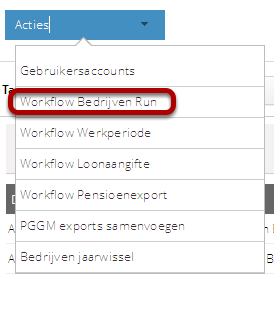 Click on the 'Actions' menu and select 'Workflow Company Run'. 1. You can select tags here (these must have been created already). 2. You can select per debtor here, in that case you can process all companies under one debtor at the same time. It is of course also possible to process everything at once by selecting 'All'. 3. Select an action you want to execute, for instance, processing a payroll or making the employee login visible. Select the companies and click on 'Next'. You get an overview of the companies you are going to run. Click on 'Run companies'. The companies have now been processed.